Paul Sladen suggested that I use a different variant for friendly, an option I didn’t think of because my unexpectedly not up-to-date font (still on 10.10) file didn’t contain a light variant. The dot pattern in the left sticker repeats the relative size and distance of the 3 heads of the Circle of Friends. The right sticker picks up geometry from the logo draft. I like 3b. It looks good and is simple. 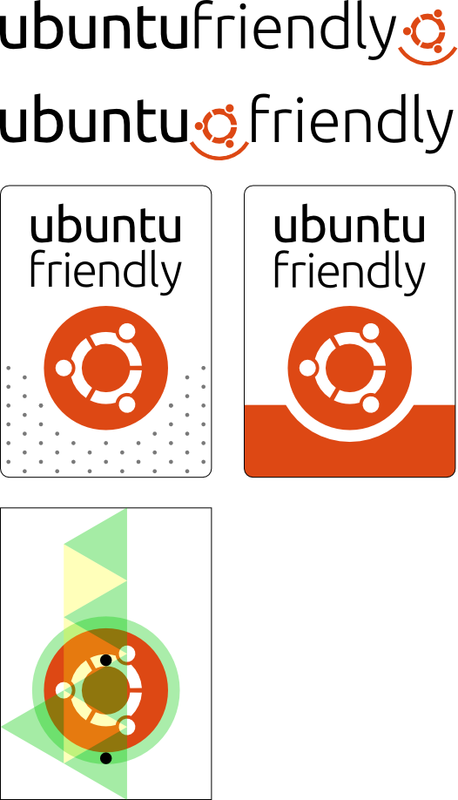 There isn’t enough contrast or distinction in the first one between the “ubuntu” and “friendly”. It makes it look like an “oops” or printing error, rather than a deliberate separation. Second one isn’t too bad, but it is all too “straight” (on the baseline). It might be more interesting if the logo was off-centered (maybe vertically? make it a little higher than the text baseline?) Again, there isn’t much distinction between the two words. Third one looks pretty good. The logo stands out which is nice, but the top and bottom being the same color just doesn’t work for me. Maybe the bottom dots can be made softer, and continues behind the logo and up the image to the baseline of “friendly”, slowly fading as it moves up? The fourth one is pretty good. It may not be the most “exciting” of them but there is also nothing really against it either. I like the attempt in the 5th one to splash in some color but the Green has no precedence in Ubuntu to draw from, nor the black dots. It is a nice idea, but needs more thinking about before being in the league of the other 4. I just looked at the first set, and I definitely prefer the direction you are going with the second set. They look cleaner and more professional. Thanks for the detailed feedback, though I can’t follow that perception at all, especially regarding the contrast.